Residents of Ughelli South council area of Delta State, on Saturday, apprehended two suspected ritualists who disguised as mentally-challenged persons. 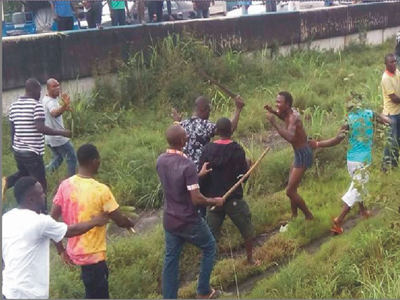 The two men were said to have attacked their victim, a woman who was gathering sharp sand along the road side on the Otokutu end of the bridge. D POST gathered that the suspects waylaid their victim and were struggling with her, possibly trying to drag her to their hideout under the bridge, when she raised an alarm which attracted passers-by and residents. The duo was apprehended and beaten to a pulp before being handed over to the Jeremi Police Division. Although they were not found in possession of human parts to suggest they are ritualists, several school bags belonging to pupils, clothes and female handbags were found in their hideout under the bridge. When contacted, the state Police Public Relations Officer, PPRO, Celestina Kalu, was not available for comment as at press time.